On a sunny July afternoon, we had the opportunity to run this boat through her paces on Lake Muskoka. Waves were minimal and the ambient air temperature was moderate – about 22 degrees C or 76 degrees F.
Rossiter started building the R 14 about 15 years ago and they have continuously made minor upgrades and tweaks based on consumer demands. The model we tested was actually a dual console and she’s available in the consumers choice of either dual or single console. On boarding the boat the attention to detail is immediately noticeable throughout every aspect. 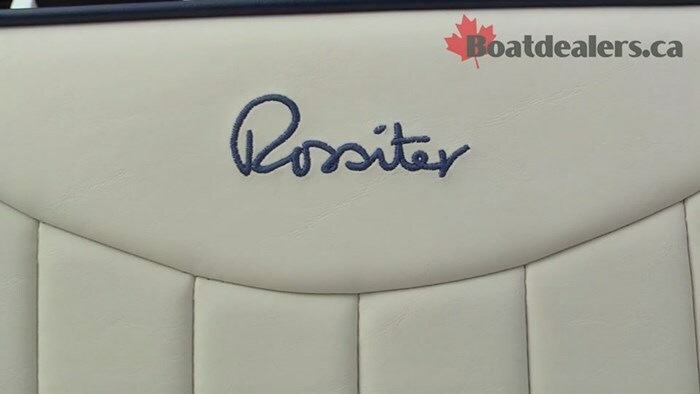 Rossiter has indeed taken the time to ensure that even in a small boat there is no shortage of creature comforts. 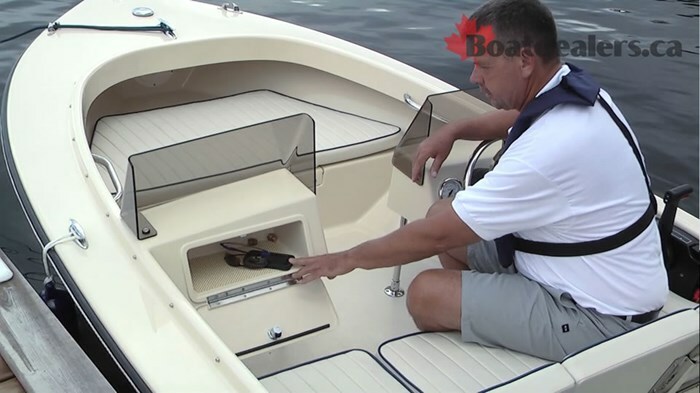 The quality of the fit and finish is evident everywhere – I really appreciated this when we looked closely at the storage compartments in the bow and under the seats. 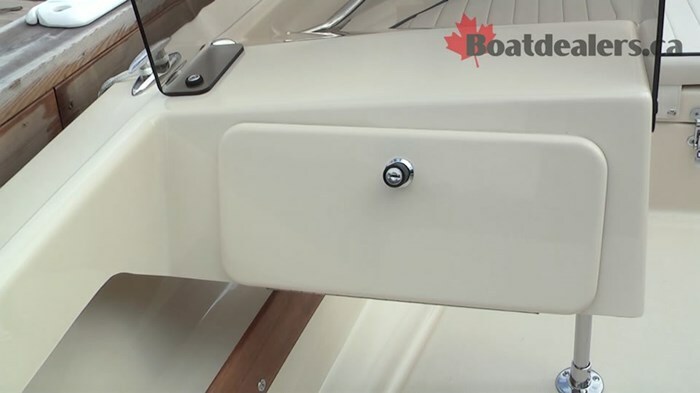 In both areas not only was the access port very neatly trimmed but even the base of the storage compartments shared the same smooth glass finish as the rest of the boat. 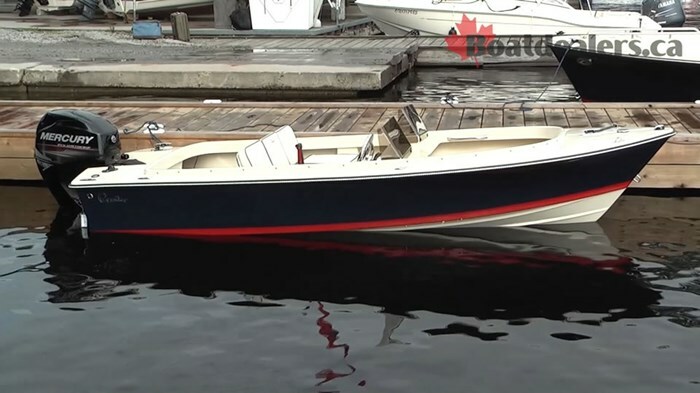 Our test boat was powered by a 40 HP Mercury 4 stroke. 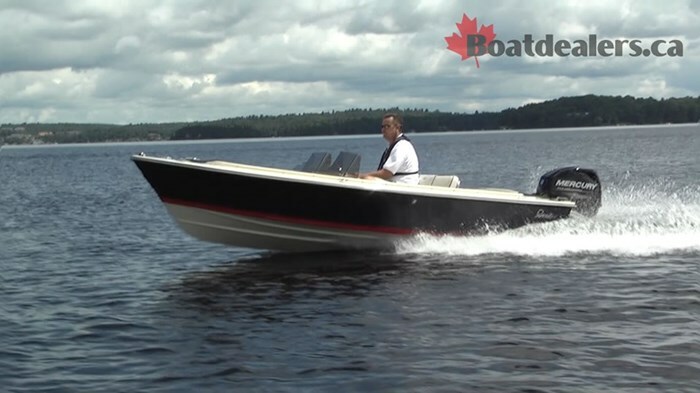 Rossiter makes their boats available with your choice of either Mercury or Yamaha power and the R 14 will take up to a 50 HP although they recommend the 40 HP package. 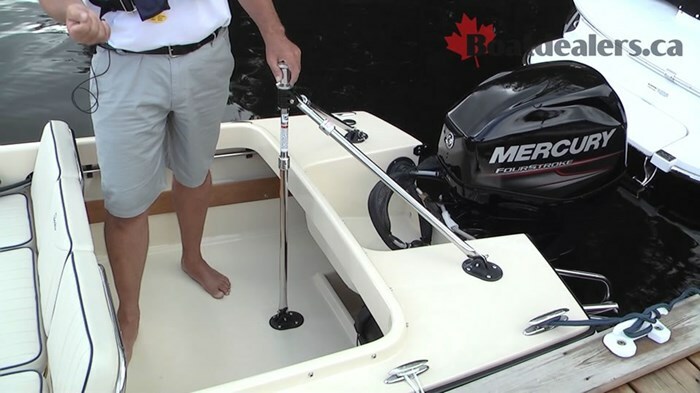 For Canadian consumers this combination creates a great solution if you’ve got kids between 12 & 16 coming to the cottage and wanting to drive a boat. 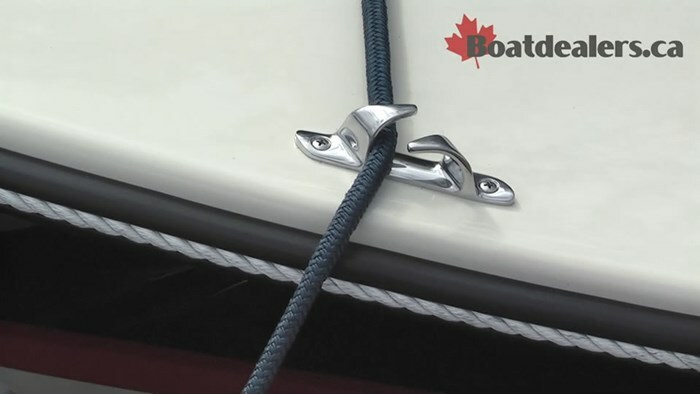 I appreciated the seven through bolted cleats on the boat noting these make fender and line combinations a breeze. I also smiled at the subtle teak finishes in the interior knowing that these were the only pieces of wood anywhere on the boat. 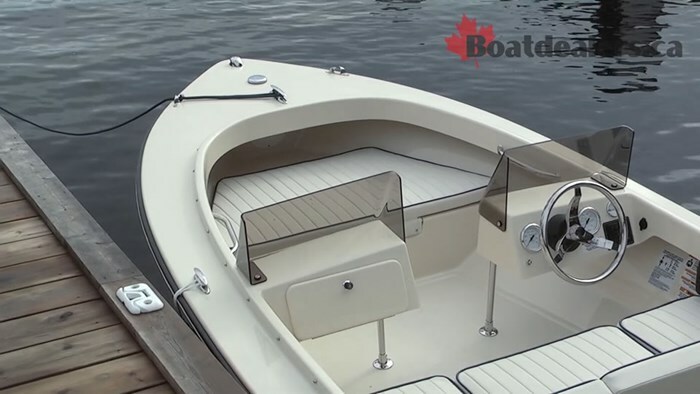 Rossiter builds their boats in a 3 part process bonding the hull to a full liner and then the deck, this process creates an incredibly smooth, safe, stable and dry ride. When we headed out onto the lake for some speed trials I had modest expectations of a 14’ boat with a 40 HP Engine…boy was I wrong. With just me on board the R14 leapt up on plane in under 4 seconds and easily found her way to a top speed of just over 30 MPH. She cruised very comfortably at 22 MPH with a nice smooth wake behind her stern. I could easily envision the kids out there laughing and enjoying an afternoon with friends and a tube (our test boat was equipped with the optional ski pylon). The most impressive moment for me was how dry the ride was. No matter how hard I turned the boat or how much I pushed her through my own wake there was nary a single drop of water that ever made its way in to the boat. 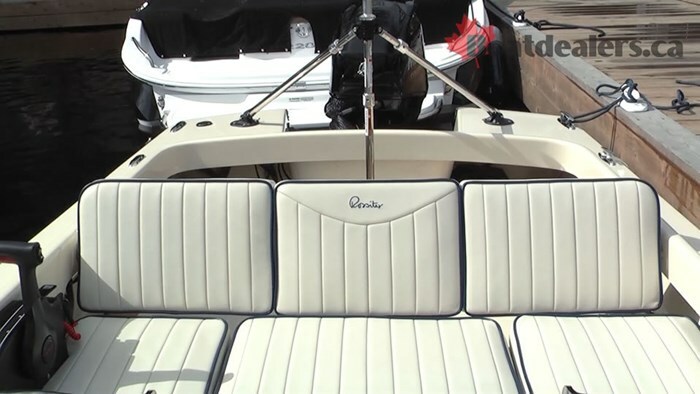 If you’re looking for a great combination of a small cottage taxi boat with lots of interior space for coolers and groceries and a super safe package for the kids, then look no further than the Rossiter R 14.